Storing paper documents takes up a lot of valuable office space which could be used to expand offices and increase production. In extreme cases, paper can even pose a hazard like the backlog of files at one VA Center in North Carolina, where files were so heavy they were causing floors to bow. The report also pointed out that files (37,000 of them!) stacked on top of filing cabinets posed a hazard to workers, exposed important information to risk of damage and loss, and hindered productivity by making files difficult to locate. Digitize paper-driven tasks. There's no question that paper filing systems are on their way out. Inefficient filing cabinets take up valuable office space and cost companies thousands by slowing down workflows and creating bottlenecks when documents are misfiled or lost. Electronic document scanning can digitize paper-driven tasks, helping businesses make the transition to paperless office processes. Advanced scanning processes. 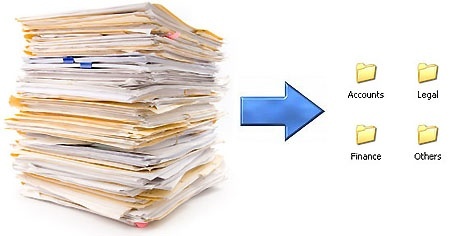 Implementing paperless office processes doesn't mean years of tedious indexing to convert archived paper files. Advanced document scanning solutions speed up indexing and storage with intelligent optical character recognition, reading through your documents to locate and use key terms and formats. Improve workflows. Sending and sharing documents is easier and less expensive when files are digitized. Statistics show that paper documents are copied up to 12 times, costing time and resources. Files stored electronically can be accessed and shared via email or stored in document management systems. Secure Your Data. Paper documents are hardly secure. Electronic document scanning and storing will protect your company's collective knowledge from unauthorized access. Restrict access only to employees authorized to use certain documents. Protect your files from hackers and malware with security programs that protect networks and track who accessed files. To learn how easy it is to get paper-based information onto your network with document scanning, contact Valley Office Systems today!